The Dominguez Canyon Overlook trail is located in the Dominguez Canyon Wilderness Area near Grand Junction, Colorado. The trail begins in Cactus Park where it follows an old jeep road that ends on the rim of Big Dominguez Canyon. At the time the area was converted to a wilderness area the jeep road was closed to all but hiking and horseback riding. 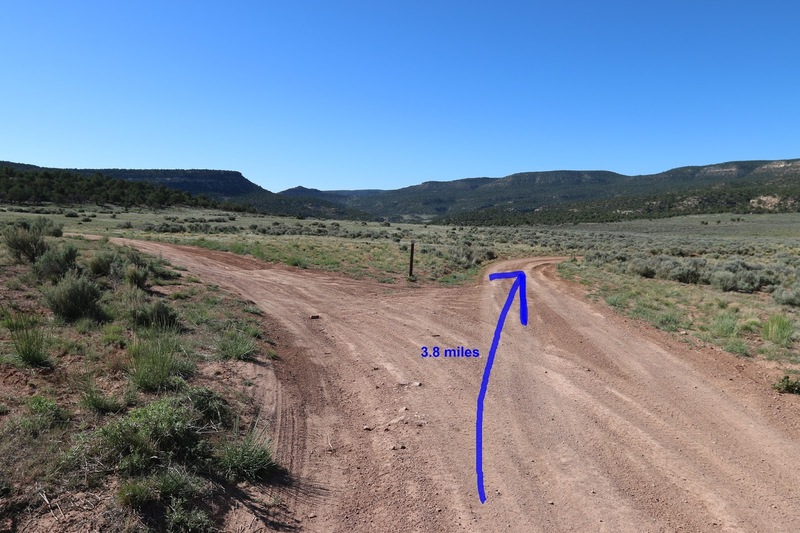 The trail provides access to the Dominguez Canyon Cutoff trail and to Triangle Mesa. Finding your way to the trailhead can get a little involved so we will go through it step by step. Begin by driving south out of Whitewater, Colorado and turn west onto Highway 141 towards Gateway. Follow Highway 141 for 8.4 miles to the Cactus Park turnoff which comes up on the left just before mile marker 145. The road has some rock ledges right at the turnoff but it gets a little better after that point. A high clearance vehicle is recommended due to ruts created by people driving on the road when it is muddy. Continue past the restroom and staging area at the half mile point. Stay to the left at the 1 mile point unless you are familiar enough with the alternate route to find your own way. 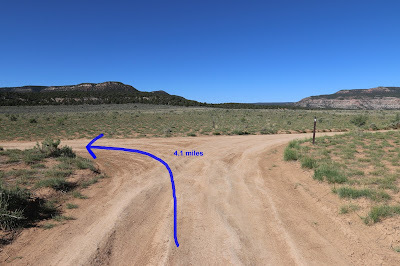 The Kokopelli trail connects to the road at the 1.2 mile point and begins to follow it. At the 3.8 mile point from Highway 141 bear to the right. At the 4.1 mile point turn left. The Kokopelli trail continues to the right. Continue following the road for another mile or so. After about a half mile the road goes through a couple of washes where a short wheelbase and possibly 4-wheel drive may be needed. We didn't have to put our Tundra in 4-wheel drive but it did slip a couple of times. We stopped right before the second wash and road our mountain bikes the last half mile to the trailhead. When we had gone through the wash several years ago in our F250 the rear bumper was dragging. The Tundra sits higher and probably would have made it okay. Short wheel based SUVs should have no trouble. 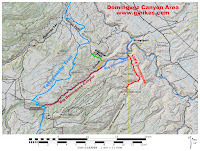 Right after hiking around the gate the trail crosses into the Dominguez Canyon Wilderness Area. The old jeep road is worn enough that route finding is no problem at all. We did see a set of fresh ATV tracks and the rider either had a key to the gate or knew how to pick the lock. Seeing fresh tracks kinda ruins the whole wilderness experience. The trail does quite a bit of climbing to get out of Cactus Park and over to Dominguez Canyon. Looking at the elevation profile shows that this trail is uphill in both directions. The total elevation gain is only 853 feet so even though there are some steep sections it doesn't add up to a great deal overall. Just past the 1.1 mile point the trail passes an old route that has been closed for restoration. There is no advantage at all of going that way. Hiking gets pretty easy as the trail continues. There are some good views of Triangle Mesa that come up where the trail wraps around the east side of the mountain. 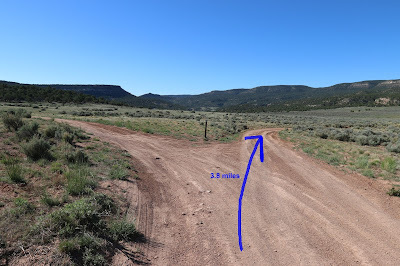 Near the 2 mile point the trail passes the old Triangle Mesa road. From there the trail turns more to the west and shortly afterwards it reaches the canyons edge where an 'End of Route' sign marks the turnaround point. Off to the right is another marker where the singletrack Dominguez Cutoff trail that leads down into the canyon begins. If you are considering whether to continue past this point the last stretch of the cutoff trail travels down a slide area that is steep and has a lot of loose rock. The views of the lower section of Big Dominguez Canyon are breathtaking from the rim. It doesn't take much to appreciate why so many people wanted to protect this area with a wilderness designation. There is about 40 feet more of climbing on the trip back than there was on the trip in. The climbing on the trip out is spread out over a little more than 1 mile making it much easier to handle. Backpackers should try to camp only in existing campsites if possible. There is a good spot above the creek at the bottom of the cutoff trail but all areas from there to the Bridgeport trailhead are 'Day Use Only' and closed to camping. Be sure to bring plenty of water because you won't find any on the Overlook trail. 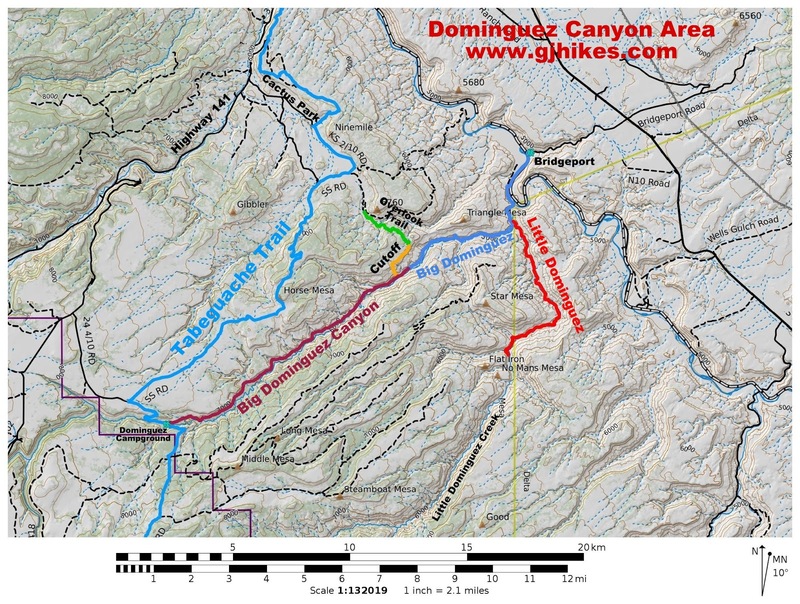 The only dependable water source in the area is Big Dominguez Creek. If you would like to see the Dominguez Canyon Overlook for yourself then all you have to do is 'Take a hike'.